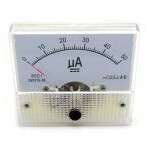 Panel Meter 200uA full scale with 63mm wide x 31mm high viewing area. Pictur..
Panel Meter 50uA full scale with 63mm wide x 31mm high viewing area. These a..
BAS16 High Speed Switching Diode, 100v 215mA. SOT-23 packageWe can genera..
BC547B NPN Transistor 45v 100mA 500mW TO92 package suitable for switching and low pow..
BC558 PNP Transistor 45v 100mA 500mW TO92 package suitable for switching and low powe..
BD682 Transistor PNP Darlington 100v 4A 36W TO-126, suitable for medium power..
PAL type male crimp connector to suit RG6 coaxial cable, Nickel plated brass.Requi..
PAL type male clamp to suit RG59 coaxial cable commonly used in older antenna inst..